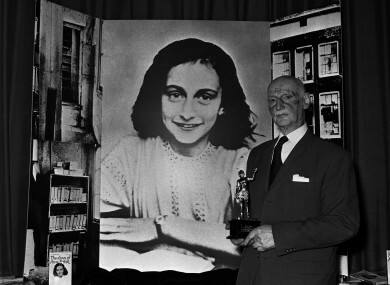 Dr Otto Frank, the family's only survivor, receives an award in 1971. A French academic and an MP have published online the famous diary of Anne Frank, despite a dispute with rights holders as to whether the work is now in the public domain. The duo claim Diary of a Young Girl became public property on 1 January 2016 as 70 years had elapsed since Frank’s death at the age of 15 in the Bergen-Belsen concentration camp in 1945. Under a 1993 European law, a book loses exclusive copyright at the start of the seventh decade after its author or authors are dead. “In regards to this book, this testimony and what it represents… I bear the conviction that there is no greater combat than to fight for its freedom, no greater tribute than share it without restriction” wrote University of Nantes lecturer Olivier Ertzscheid, who posted the work online in its original Dutch. Frank used the diary to chronicle her life from June 1942 to August 1944 while she and her family were in hiding in Amsterdam. A tableau of life for persecuted Jews in Nazi-occupied Europe, it was first published in Dutch in 1947 by her father, who deleted some passages. More than 30 million copies have been sold. The Anne Frank Fund, based in Basel, Switzerland, holds the rights to publication and told AFP previously that it had sent a letter threatening legal action if the diary was published. The Fund argues that the book is a posthumous work, for which copyright extends 50 years past the publication date, and that a 1986 version published by the Dutch State Institute for War Documentation (NIOD) is under copyright until at least 2037. In October, Ertzscheid published two French versions of the book on his website, only to take them down after the publisher Livre du Poche sent a formal notice stating that copyright for translators was still in effect. He pointed out that another famous work with World War II ties had also become public domain on Friday: Adolf Hitler’s anti-Semitic manifesto Mein Kampf. French parliament member Isabelle Attard of the Green Party also published Frank’s book online in its original Dutch on Friday, arguing that “fighting the ‘privatisation of knowledge’ is an absolutely topical issue”. Attard has criticised the fund’s opposition as a “question of money”, adding that if the work was in the public domain, its author would gain even more renown. Email “You can now read Anne Frank's diary online”. Feedback on “You can now read Anne Frank's diary online”.